Hair loss is a complex problem and it only required a simple answer. For hair loss, you don’t need an expensive treatment or products. In fact, you just need to start making logical decisions on how to care your hair and body. Most people think that they are giving their best to care their hair but they are not. The best thing you can do for your hair is to eat a balanced diet food. Many types of research prove that a healthy diet with the right mix of iron, protein and other nutrients can improve your look and balance your hair. To get a healthy diet you need to determine the changes for healthy hair. According to experts, healthy hair grows from each hair follicle which is not easily brokenly and it is aligned with a healthy scalp. It is also responsible for bouncy, thick, shiner and long hair. A balanced food not only provides you with a proper nutrition but it also satisfies the need for your healthy hair. Today many scalp issues arise with the imbalance of proper diet. In many research, it found that hair loss is having a direct relation to protein. A strand of hair is composed of mostly protein, which means your hair needs protein to grow. As you need to know that hair and nails are both made of different types of protein called Keratin. When your 90% of your hair in growing phase then your every individual hair will last upto 2-3 years. So when your hair enters into the resting phase then it lasts around 3 months during this it shed and replaced with your new hair. If you didn’t intake a good amount of protein in your diet then a small number of hairs may go in a resting phase. This amount of hair people don’t even notice. But if you get a large number of hairs into a resting phase then perhaps it may be alarming for you. It may mean that you are not getting enough nutrients of protein; this can be fixed with diet. Today, in this stressed situation most of the people don’t have enough time to eat food properly. To solve this problem expert recommended eating a good amount of protein food in their breakfast or in lunch. This is the most appropriate time for getting enough nutrients from the food you eat. What are The Good Sources of Protein? Vegetarians need to take special care in obtaining adequate protein since the protein quality is generally poorer in vegetable products. But if you are a non-vegetarian who regularly uses dairy products and eggs, as well as a variety of legumes and nuts then you should not have any difficulty obtaining enough protein. It is believed that hair loss in individuals sticking to low nutrient diets is caused by an inadequate protein in their food intake. 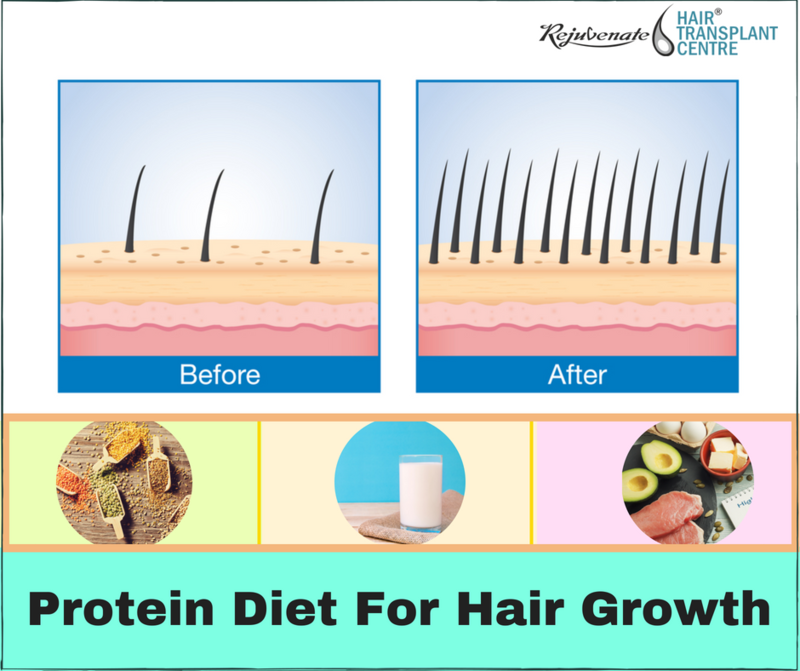 There is medical documentation showing that patients following severely restricted diets show signs of hair loss or weak hair when there is low in protein diet and therefore it also easier to pull out hair from the scalp. You can include this in the pool of nutrient deficiency. People who religiously follow a weight reduction diet that is both low in calories and deficient in protein. Dry, colourless and sparse hairs are several of the common traits. Will a high protein diet promote hair growth? Excess protein, unfortunately, will not help you to grow hair at a faster rate. In many research, it is found that people actually have an overabundance of protein in their diets. However, they also prone to hair loss and baldness. Intake high amount of any nutrients will not solve the problem of any disease. But, if you are physically active, the extra protein calories will be converted to energy and be burned off. However, if you do not engage in exercise, they will be converted and stored as fat. Thus, too much protein is a two-sided villain, thickening our waistlines while making our wallets thinner as we spend money on food that is unnecessary. So, try to eat enough protein – not too little, but also not too much. If you are conscious about your hair and appearance, then change your diet plan by distributing the food into small and frequent meals. Having one large meal is not so beneficial for your hair and well as for your health. The obvious question arises why it is necessary to do? Fat consumption is always good when you take it for a taste. Fats do contain essential nutrients, but excessive consumption of fats can lead to heart disease and other problems related to high levels of cholesterol. Drink at least 8 glasses of fluids daily. Avoid high-calorie soft drinks. Water regulates body temperature, serves as a lubricant, aids digestion and helps in the elimination of toxic by-products. Avoid refined sugars: These are only taken only for taste but seriously do nothing to nourish our bodies. If you avoid it then it will be good for your health. Limit your alcohol intake: If you love to enjoy your weekend with alcohol then try not to be excessive. As quitting alcohol is really not possible for everyone but limiting the quantity can be possible. As we all know that alcohol in excess can be very harmful. The direct effect that refined sugars and alcohol have on our hair is still somewhat speculative. However, one thing is conclusive. If they make up a major part of the diet, they will displace other nutrients, which are essential for hair growth.Experts believe that you must approach those foods and drinks which are really good for health.